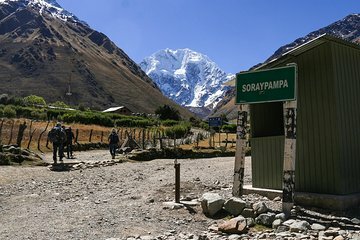 Se você está procurando uma alternativa para a movimentada e muitas vezes reservada Trilha Inca, não procure mais do que esta excursão de 5 dias pela trilha Salkantay Trail saindo de Cusco. Adequado para viajantes com um bom nível de condicionamento físico, esta caminhada leva você através de geleiras, selva alta, rios caudalosos e aldeias montanhosas dos Andes. O passeio culmina com uma visita a Machu Picchu, Patrimônio Mundial da UNESCO e uma das Novas 7 Maravilhas do Mundo. Todas as refeições, acampar durante a noite ou hospedagem, e as taxas de entrada estão incluídas. Adventure of a lifetime, Carlos was the most passionate, knowledgable guide you could have. He took exceptional care of everyone, catered for everyone's different ability and flexed the trip to maximise the experience. The food was excellent, more than enough for everyone and cooked fresh. Everyone was looked after and it was an amazing opportunity to meet other people from different countries not just in our group but others along the way. Whilst the trip was advertised as easy/moderate its worth noting that the terrain, distance isn't difficult but the altitude makes it the most challenging thing I've done. Ensure you have at least 2 days in Cusco beforehand to acclimatise to the altitude, walking poles are a massive benefit especially on long downhill sections. Travel light especially your day bag and there is places on route to purchase food, drinks etc as you go.